As a way to understand and appreciate place through the ears and eyes of others, we are making our local sounds available for you to turn into audio art. With a Creative Commons license, we offer sample packs of field recordings emphasizing the non-human. Download here: http://go.osu.edu/localvocals. The Borror Lab is allowing non-commercial usage of any of the 40,000+ animal recordings in their archive for use in submitted audio works. We also invite you to submit sound works that utilize your own recordings of urban animals local to your region. We look forward to your creative soundscapes, music, and/or conceptual sound art works. 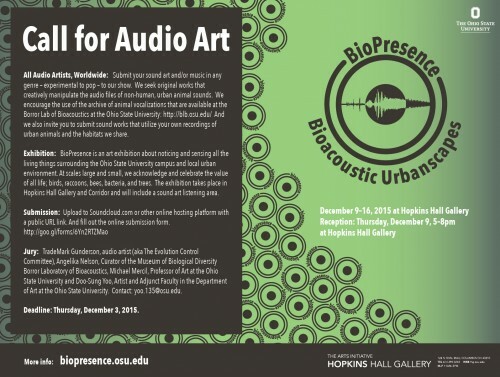 Exhibition: BioPresence is an art exhibition about noticing and sensing all the living things surrounding the Ohio State University campus and local urban environment. At scales large and small, we acknowledge and celebrate the value of all life; birds, raccoons, bees, bacteria, and trees. We look to the wonderment and wisdom of intertwined symbiosis that makes the Ohio State University Campus a unique urban ecosystem that involves human and non-human species. The exhibition will be in Hopkins Hall Gallery and Corridor and will include a sound art listening room. Place: The Ohio State University is a vast campus, with areas from the the very urban to the very rural. Every day our 70,000 human animals overlap and mingle with 70,000+ non-human animals. Requirements: Stereo audio file, duration of 1 to 12 minutes, must be in WAV, AIFF, or MP3 (no less than 256kbps). Must use animal sounds/vocalizations as part of the composition. Deadline: Thursday, December 3, 2015. Jury: Audio artwork will be juried by TradeMark Gunderson, audio artist (aka The Evolution Control Committee), Angelika Nelson, Curator of the Museum of Biological Diversity Borror Laboratory of Bioacoustics, Doo-Sung Yoo, Artist and Adjunct Faculty in the Department of Art at the Ohio State University and Michael Mercil, Professor of Art at the Ohio State University. Acceptance announcements will be made by the end of December 6.